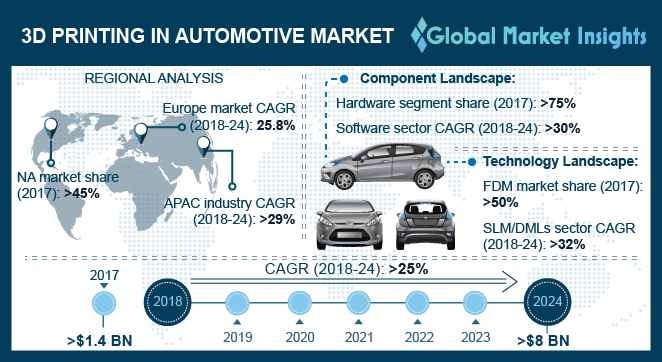 Automotive 3D Printing Market size is set to be over USD 8 billion by 2024; according to a new research report by Global Market Insights, Inc. The automotive 3D printing market is propelled by the rise in the number of government and industry initiatives to sponsor the additive manufacturing technology. Several countries have developed national programs to support the university level research. For instance, the Canadian government has launched the Industrial Research Assistance Program (IRAP) to drive the use of 3D printing among small- and medium-sized organizations. This is encouraging organizations to adopt the cutting-edge technology to reduce the cost of operation and increase the productivity. The Electron Beam Melting (EBM) technology in automotive 3D printing market is expected to grow at a CAGR of over 28% during the forecast period. The technology utilizes high-power electron laser to melt & fuse metal alloy powders used for the fabrication of automotive components in accordance with the electronic data. The electronic laser managed by the electronic foils provides extremely fast & accurate beam control, enabling the manufacturers to maintain numerous melting points simultaneously. Furthermore, the electron laser heats the powder bed to optimal ambient temperatures specific to the material. Thus, the parts produced through the technology are free from residual stress. Manufacturing is estimated to emerge as the most lucrative application of automotive 3D printing market. It is anticipated to grow at a CAGR of approximately 30% during the forecast timeline. The market is driven due to the superior properties and cost benefits offered by the 3D printing technology in the manufacturing process. It increases the manufacturing efficiency by eliminating the product assembly stage across the manufacturing cycle. The traditional manufacturing process is characterized by multiple production stages & interconnected storage of semi-finished products resulting in longer lead times. On the contrary, 3D printing manufacturing process is shorter & faster as multiple stages are combined into a single production step. This eliminates the need for intermediate material handling & intra logistics transport costs. The Asia Pacific automotive 3D printing market is anticipated to achieve a growth rate of over 29% over the forecast timespan. The growth in the market is driven by the increasing investment by public & private establishments. The industrialized economies along with emerging nations in the region are exploring various opportunities for the advancement of the 3D printing technology in the automotive sector to strengthen the productivity & competitiveness. Countries including India and China have invested heavily to commercialize the technology in the automotive sector. China has been investing in the additive manufacturing technology for over a decade and the Chinese authorities have committed millions of dollars to a seven-year project aimed at advancing the technology in the vertical. The major companies operating in the automotive 3D printing market are Ponoko Ltd., Hoganus AB, Exone, Voxeljet AG, Arcam, Startasys, Autodesk, 3D systems, Materialise, Nano Dimension, Proto Labs, SLM Solutions Group, Electro Optical Systems, Concept Laser, and Renishaw Plc. The companies operating in the market are attracting robust investments to capitalize on the untapped market opportunities. The major players in the market are collaborating with other expert companies in the market to integrate the technology with their manufacturing cycle and develop new product offerings to gain a competitive advantage over its competitors. For instance, in 2015, Koenigsegg, a Swedish car manufacturer partnered with Stratasys to develop its in-house 3D printing facility. Koenigsegg intends to use the technology for the rapid prototyping of the metal parts used in its automobiles.